﻿ Mont Choisy Beach Villas Pulau Mauritius. JIMAT di Agoda.com! 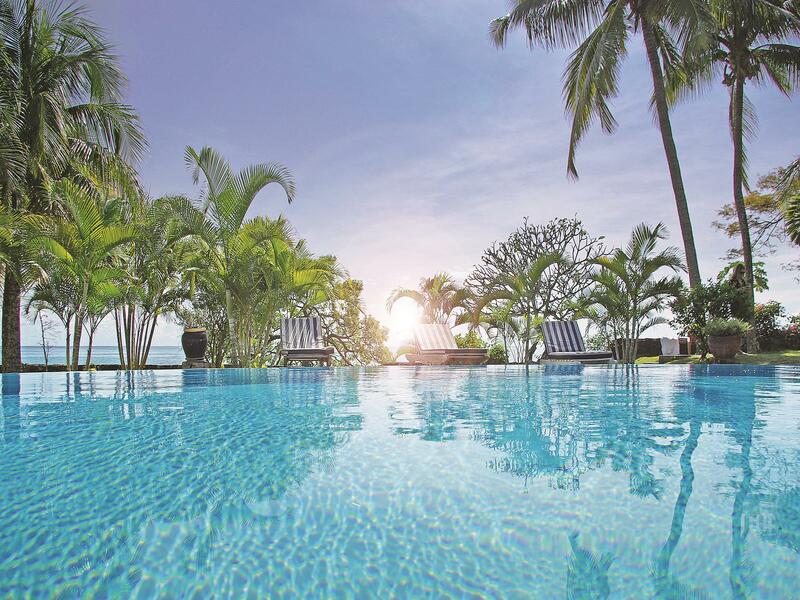 Ada soalan mengenai Mont Choisy Beach Villas? Terletak pada kedudukan yang baik di kawasan romantik, pantai di bandar Pulau Mauritius, Mont Choisy Beach Villas menyediakan tempat yang paling sesuai untuk anda berehat seketika dari kesibukan hari anda. Hanya sejauh 65 Km, hotel 3-bintang ini boleh diakses dengan mudah dari lapangan terbang. Juga terletak berdekatan adalah Tempat Pelayaran Troue aux Biches, Pantai Trou aux Biches, Sunset Boulevard. Mont Choisy Beach Villas menawarkan perkhidmatan yang sempurna dan semua kemudahan penting untuk menceriakan pelancong. Hotel ini menawarkan pelbagai kemudahan di lokasi untuk memuaskan hati tetamu termasuk yang arif. Hotel-hotel telah direka demi keselesaan dan memudahkan tetamu. Sebahagian bilik menyediakan televisyen skrin rata, bilik larangan merokok, penyaman udara, meja, beranda/teres. Hotel ini menawarkan pelbagai kemudahan rekreasi yang sangat baik, termasuk kolam renang terbuka, menyelam, rumah urut, solarium, taman. Mont Choisy Beach Villas adalah destinasi sehenti anda bagi penginapan hotel berkualiti di Pulau Mauritius. Near the beach, bus stop and restaurants. Our first visit to Mauritius was extremely eventful, fun, exciting and amazing! 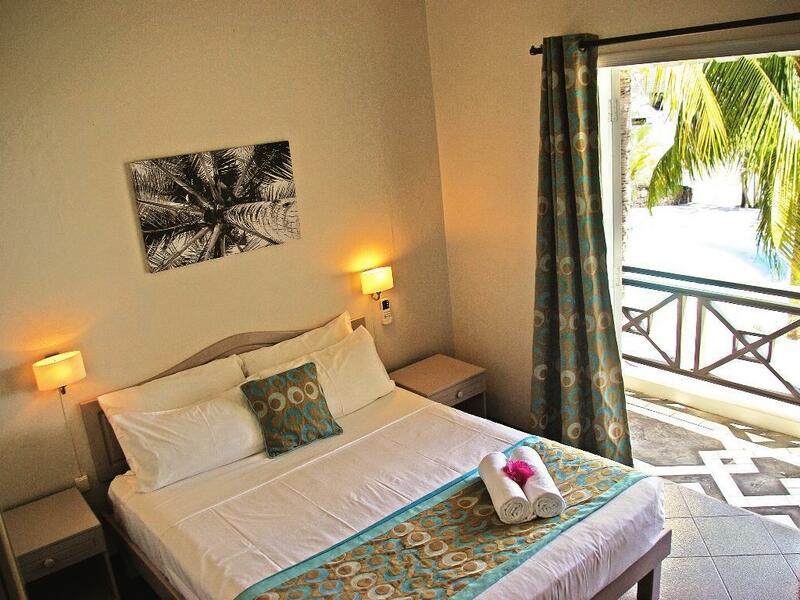 Mont Choisy Beach Villas is a beautifully located hotel right in the middle of the amazing Trou Aux Biches road. They have a studio apartment concept with a huge kitchen (microwave, oven, four cylinder stove, fridge, crockery and every single thing that you would require in a kitchen), spacious bathroom with separate bathing area, a large living room + bed room, a balcony with a fascinating view of the garden followed by a compact swimming pool followed by the gorgeous beach (do not miss the sunset between 6.30 pm - 7 pm because it is a spectacular sight!). The staff is extremely helpful and kind - special thanks to the reception lady Suman and our housekeeping point of contact Mala for literally everything that we required!! Since it is a villa, one must carry all necessary food items in advance as the Mont Choisy Super Market (5-7 mins walk on the right if your back faces the villa) is expensive! All units Are NOT SEA FACING..unless you get unit 1 or 2 or 3..we had unit 5 the views were disappointing.i had paid a high price for a sea view unit..therefore chose this resort..very disappointed ...the furniture could be cleaned properly. Lots of stains on table chairs and bed side pedestals..we did not have unit cleaned once whilst staying there due to cyclone ..we had to clean unit and do dishes ourselves..disappointing..hardly anybody there to assist..tv chanels hardly worked..washing machine did not work. the property could make use of an electrical geyser and not just solar..our family needed to shower at 4am due to early check out..no hot water not even warm..wifi was very slow ..lots of mosquitos ..double story unit..no aircon or fan downstairs in the heat an could not leave doors open due to mosquitos. 2 aircons upstairs in each room.all other units had dryin line..ours did not..no facilities except swimming pool. Con Swimming pool not suitable for children. Need a rented vehicle to stay Pro Facilities is superb. Staff is nice Near to beach, shopping mall, and hence convenient. We enjoyed our stay at Beach Villas, the Villas are independent with Kitchen and all utilities. So you can cook. The facility is right on the beach in a calm area, so you can relax well. If you are looking for activity its around the corner also. No one disturbs you so the kids can run around and feel at home. Dear Yogesh, Thank you for your kind review and for taking your time to share with us your experiences. We are pleased to learnt that you have loved your stay. We hope to have the opportunity to welcome you back again soon. Best regards, The Management. 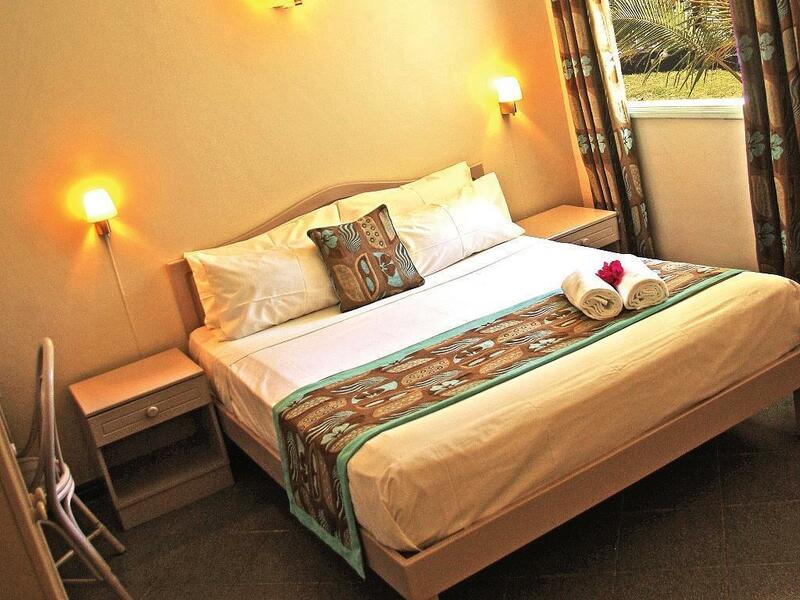 Spent 14 nights in a 2 bed-roomed unit at Beach Villas at end of April 2014. The staff were great, nothing was too much trouble. The units are adequately equipped for a holiday apartment. On two occasions we entertained and the staff were more than helpful in bring us an extra dining room table and chairs as well as extra crockery & cutlery. The swimming pool was always clean and well kept, and there is direct access to a beautiful private beach . There are many restaurants close by and a bus stop right outside the gate. I would recommend hiring a car though. Will definitely be back to Beach Villas. Bushaltestellen direkt vor der Tür. Sauberer Pool, Liegemöglichkeit am Strand. Zum Schwimmen ca 200m. Schöne Zimmer mit Pool und Meerblick. Wir (Familie mit Kleinkind) verbrachten 2 Wochen in der Anlage und waren sehr zufrieden. Die Apartments sind sauber, gepflegt und recht gut ausgerüstet. Die erste Woche verbrachten wir in einem Studio, was uns dann nach einer Weile etwas zu eng war mit dem Kind. Den Umzug ins grössere Apartment übernahm das Personal, während wir den Tag ausserhalb verbrachten. Auch sonst erlebten wir das Personal stets sehr bemüht, freundlich und hilfsbereit. Die grösseren Apartments sind näher am Meer und am Pool, die Terrassen sind dadurch besser gelegen. Für uns hat sich das grössere Apartment absolut gelohnt, da man viel draussen sitzt bei diesen Temperaturen. Das schönste Apartment ist die Nr. 1. Die Anlage hat keinen eigenen Sandstrand, sondern Vulkanstein. Ca. 5min zu Fuss ist die Mont Choisy Beach, die mit Kleinkindern sehr zu empfehlen ist, weil es viele Bäume (Schatten) und einen sauberen weissen Sandstrand hat. Der Pool ist eher für grössere Kinder geeignet. Für die Kleinen hat es einen schmalen Streifen, in dem es unserem Kind jedoch relativ schnell langweilig wurde. Der Pool ist nicht gesichert. Man muss das Kind also dauernd beaufsichtigen. Die Anlage hat keinerlei Verpflegungsmöglichkeiten. Es gibt aber genügend rundherum. Insgesamt und im Vergleich sehr gutes Preis-Leistungs-Verhältnis. Begin april 10 dagen naar Mauritius geweest. We hadden geen behoefte aan een all inclusive resort want we wilden veel van het eiland zien. Uiteindelijk bij Mont Choisy Beach villa’s geboekt en dat bleek een uitstekende zet. Vriendelijk personeel, 24-7 bewaking en prima kamers. Goede bedden en prima airco! De ligging is ook mooi vlak bij mont Choisy beach en trou aux biches beach, het zuiden is wat ver rijden maar met een huurauto zeker te doen. Appartement très bien, avec une vue sur le magnifique jardin et la mer. Personnel prévenant. Seul bémol, l'équipement un peu vétuste. Le personnel, la propreté et le service, la proximité de la mer. Très bien accueillis par Mlle Ramani nous avons profité d'un studio au rez de chaussée agréable, fonctionnel et propre. Le personnel est très serviable et aux petits soins des habitants. Beaucoup de chiens errants pas méchants (et chats) dans tout le pays et bien sur dans le jardin de la résidence. Dommage qu'il n'y ai pas de livraison de pain et croissants le matin.